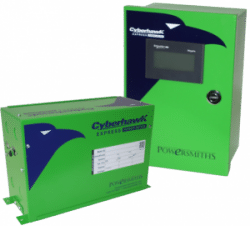 Cyberhawk™ Express is featured as the most versatile, revenue-accurate power meter. The Cyberhawk Express™ can be a single or multiple meter solution. These meters and their configurations deliver application-based, scalable solutions for basic to complex data collection and logging requirements, for a wide variety of non-residential buildings. Cyberhawk™ Express is featured as the most versatile, revenue-accurate power meter, configurable for a wide variety of applications. It boasts extensive logging capabilities that bring simplicity to data collection. The Express™ collects data like electricity, water, gas, steam, temperature, lighting, plug loads, HVAC, tenant zones and more. With rapid-deployment and easy-to-use configurations, this model cost-effectively extracts individual circuits, or groups of circuits, from mixed panels. To further simplify submetering and reduce overall cost, the Cyberhawk™ Express can measure circuits of up to 120A directly without requiring external CTs. Live data can be viewed in real-time and logged data can be downloaded from Cyberhawk Express™ locally, via a computer directly connected to the meter’s USB port. The web-server option enables browser-based remote access to live data, event logs and data trends, communication with third party systems, sensors and certified data push to Powersmiths WOW™ Sustainability Management Platform to support education, analytics and GHG reporting. Learn more about how Powersmiths WOW™ can improve efficiency and simplify building data reporting efforts.